After some big meals this holiday week we decided to go simple for one night. Simple on the food, but really, really special on the wine. Sticking to my Independence Day theme I picked a zinfandel from Turley. There is no more American wine than zinfandel, and there is no better zin than Turley. Larry Turley, who grew up in Augusta, has spent years perfecting the art of making zinfandel, and it shows in the wine he sells. You may have difficulty finding his wine because he sells most of it through his mailing list and at his tasting rooms. This zin from Howell Mountain is spectacular. It is a massive wine, full of ripe dark fruit, toasted spice and some minerality. Because of its age this wine is starting to mellow out, but there are still plenty of powerful tannins to match the bright acidity. Although Turley says his wines should be drunk as soon as he releases them, this wine will continue to get better in the bottle for at least another 4-5 years or longer. This is a powerful wine that will being a smile to any lover of big reds. It is like having your own fireworks show in a bottle. 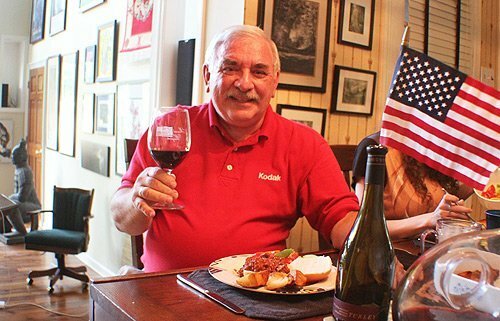 Though Larry and his family spend most of their time at their home near Calistoga on the Napa Valley floor, he also owns a home on top of Howell Mountain where he can keep an eye on his vines. When I visited there a few years ago he proudly showed me the piles of rodent bones beneath owl boxes installed in the vineyards. The owls were doing their job to reduce the use of harmful chemicals by eating vineyard pests. All Turley vineyards are either certified organic by California Certified Organic Farmers or somewhere in the process, and they use all natural yeasts in the fermentations. Winery: The story of Turley Wine Cellars is one of the most interesting in the world of wine. Larry Turley was born in Tennessee and raised in Georgia, eventually attending the Medical College of Georgia. A character from an early age, Larry seemed to challenge authority a lot. He is a big, tall gregarious guy with a wicked sense of humor. He left Augusta and finished medical school in New Mexico, eventually landing a job as an emergency room physician in wine country. Larry came home from the ER one night in the mid 1970s and found someone camping on the property he was renting. Larry drove his motorcycle through the offending tent and met its occupant, John Williams, who had just been hired to be the winemaker at Spring Mountain. They decided to have a glass of wine, which led to a couple of bottles. They became friends. Larry said they became business partners while discussing wine one night while sitting in the hot tub, “where all big California business deals are made.” The property Larry was renting was an old frog farm, and one of the hottest wines at the time was Stags Leap, so they decided to make wine under the Frog’s Leap label. Frog’s Leap was born in 1981, with Larry riding a tractor by day and sewing up accident victims by night. The winery was a huge success, so much so that Larry said he was working too hard and not working on the kinds of projects he liked. So in 1993 he sold his half of Frog’s Leap to John and opened Turley Wine Cellars to make quality zinfandel and petite syrah from old vine vineyards. He began buying up vineyards with old vines as fast as he could find them and now has two tasting rooms, one in Paso Robles and one in Amador County. 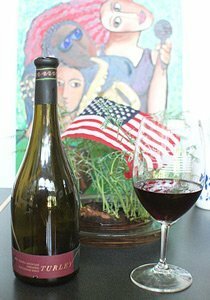 Dennis loved the Turley zin and thinks it is perfect for Fourth of July celebrations. Goes with: We had this wonderful wine with sloppy Joes, pan-fried potato wedges and cut up veggies. This meal really hit the spot. We didn’t want too much to eat; I think we were still full from the Porterhouse steaks the night before. 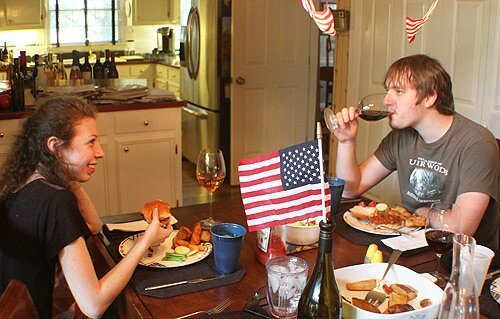 The Rattlesnake Ridge zin is a wine you could serve with an elegant dinner, so it really raised the level of our meal. The flavors in the wine were subtle enough that they didn’t overpower the simple food. And the spices in the sloppy Joe mix were tamed by the powerful fruit and tannins of the wine. The wedges are a great way to use leftover baked potatoes. Just cut the cooked potatoes in wedges and fry in a pan on medium high heat. Micheala and Michael loved the sloppy Joes and Michael enjoyed the wine.